It’s great being under one roof. We now have ample space and room to grow! CEC proudly announces the addition of our new Professional Land Surveying (PLS) Department. CEC has acquired Michael E. Rapier Surveying, Inc. (RSI). Both CEC and RSI were founded in 1998 by Michael D. Cummins, and Michael E. Rapier, respectively, and both ‘Mikes’ have enjoyed over 28 years of working together. For over 16 years, RSI has completed many surveying projects for various IDOT districts, county and municipal highway departments, and various private clients. Call on CEC for your next surveying need! Robert Vonachen, P.L.S. has recently joined CEC and is ready to assist agencies with right-of-way negotiating and relocation needs. Mr. Vonachen retired earlier this year from IDOT, District 6 as the Plat Supervisor. He is on the IDOT approved list for Negotiator and Relocation Agent. 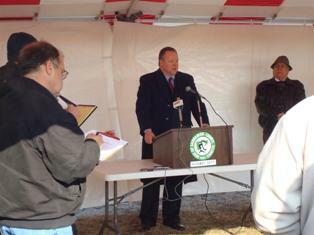 Mr. Vonachen also negotiated for IDOT for while working as plat supervisor. His vast experience and thorough understanding of plats and plans make him an excellent choice for negotiator on your next project. CEC announces Kimberly S. Cummins, P.E. as the C.E.O. Effective June 1, 2015, Kimberly S. Cummins, P.E. has become majority owner of Cummins Engineering Corporation and is announced as the C.E.O. Michael D. Cummins, P.E., S.E., founder of CEC, will maintain his role as President of the firm. Cummins Engineering announces Kim Cummins to join CEC as Vice President. CEC proudly announces that Ms. Kimberly S. Cummins will join the firm in September, 2013 as Vice President. Kim joins CEC following a 15- year career with the Illinois Department of Transportation, bringing excellent experience and strong management skills to the firm. Ms. Cummins will manage the operations of the company, including business development as CEC expands and grows. Ms. Cummins began her career at IDOT in June of 1998 in the Bureau of Highways at District 6 in Springfield, Illinois, working in both construction and design. In 2005, Kim joined the Bureau of local Roads as a Field Engineer for several counties and municipalities within the District, including the City of Springfield, Cass, Christian, Macoupin, Mason, Menard, and Sangamon Counties. Ms. Cummins worked with these local agencies over the last (8) years helping them accomplish their local roads, streets and bridge programs. More recently, Ms. Cummins has been involved in Statewide Programs including Public Private Partnerships (3P) and Design Build Legislation. Kim has a Bachelors of Science in Civil Engineering from the University of Illinois at Urbana Champaign and was one of the first graduates to complete the Technology Management Program, which is now a Masters Degree. CEC celebrates (15) fifteen years of business on August 27, 2013. Steadily expanding since it was established in 1998, CEC employs a strong and experienced professional staff providing civil engineering services for roads, bridges and other structures. Some notable CEC projects include Veterans Parkway in Springfield, the Sangamon Valley Bike Trail on the west side of Springfield, renovation of the Vachel Lindsay Bridge over lake Springfield, East Lake Drive at Spaulding Dam, temporary shoring of the Hy-Vee building and structural services on bridges for High Speed Rail. CEC is a growing company, striving to be one of the best places to work in Springfield. Visit our website at www.cumminsengineering.com for more information on our company, or contact our office at 217-726-8570. The Vachel Lindsay Bridge will be closed for four months for rehabilitation of the historic bridge carrying Long Bay Drive over Lake Springfield. The first phase of the Sangamon Valley Trail has officially opened along 5.5 miles of former railroad right-of-way on the west side of Springfield in Sangamon County. The State Journal Register story for this opening is linked below. Cummins Engineering announces Albert A. Niemerg as a Professional Engineer. Cummins Engineering Corporation (CEC), Civil & Structural Consulting Engineers in Springfield, announces that Albert A. Niemerg has passed the Illinois Professional Engineering Exam and received his Professional Engineering License. Albert has also recently been qualified as a Program Manager to perform bridge inspections as required by the National Bridge Inspection Standards (NBIS) of the Code of Federal Regulations. Albert has 4 years experience with CEC as a hydraulic and bridge engineer. He received his Bachelor of Science Degree in Civil Engineering from Southern Illinois University at Carbondale in 2006. Cummins Engineering announces Timothy S. Howard as Head of the Hydraulic Engineering and Environmental Services Department. Cummins Engineering Corporation (CEC), Civil & Structural Consulting Engineers in Springfield, announces that Timothy S. Howard has been promoted to the Head of the Hydraulic Engineering and Environmental Services Department. Tim received his Professional Engineering License in June and has ten (10) years experience with CEC as a hydraulic and bridge engineer. He received his Bachelor of Science Degree in Engineering from Cedarville University in Ohio in 2000. Cummins Engineering announces Timothy S. Howard as a Professional Engineer. Cummins Engineering Corporation (CEC), Civil & Structural Consulting Engineers in Springfield, announces that Timothy S. Howard has passed the Illinois Professional Engineering Exam and received his Professional Engineering License. Tim has ten (10) years experience with CEC as a hydraulic and bridge engineer. He received his Bachelor of Science Degree in Engineering from Cedarville University in Ohio in 2000. The first phase of the Sangamon Valley Trail will be located along 5.5 miles of former railroad right-of-way on the west side of Springfield in Sangamon County. SJR has posted several stories related to CEC engineering projects: the Sangamon Valley Trail, Resurfacing of Veterans Parkway in Springfield, and reconstruction of the intersection of Veterans Parkway, Old Jacksonville Road and Monroe Street in Springfield.